There are dozens of different nut allergies that exist and each allergy requires different methods to treat it. Dont assume that your doctors will tell you if theres something wrong, you need to learn for yourself what the warning signs are, what the symptoms are and how to treat the allergy if in fact you or someone in your family has it. 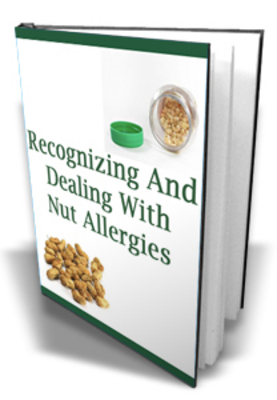 Severity of nut allergies range from mild irritation to anaphylactic shock. Even the most minute trace of nut-based proteins can cause symptoms. Dont you owe it to your family to learn all you can about this type of allergy and so that if anyone starts exhibiting symptoms, youll be able to treat them immediately? *Recognize The Symptoms Of A Nut Allergy! *Decide What You Can And Cant Eat! *Understand The Difference Between Peanut And nut Allergies They Arent The Same! *Learn What Treatment Paths Are Right For You! *Understand How Epinephrine Works And How To Use It! Protect your children, your family and your own life by reading this important book today!